That one word basically sums up these brownies. 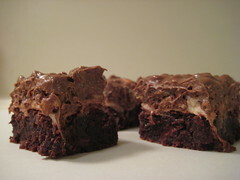 They are amazing and gooey and crunchy and moist and could easily translate to, “I’m sorry I was a shmuck,” “I love you,” “Will you marry me,” “I think you’re cool and can’t wait until our next date,” or in this case, “I obviously like my coworkers.” Who knew brownies could be so expressive? Keep in mind, the deliciousness does come at a price–these are a bit time consuming and dirty a lot of bowls, but they are so worth it in the end! What could be better than a brownie topped with marshmallows topped with melted peanut butter and chocolate with Rice Krispies mixed in? Preheat oven to 350F. Grease a 9×13-inch baking pan. In a medium saucepan, melt the chocolate, butter, and ¾ cup of the semisweet chocolate chips on medium heat. Stir occasionally while melting. Set aside and cool for 5 minutes. In a medium bowl, sift the flour, baking powder, and salt. Set aside. In a large bowl, place the eggs and whisk thoroughly. Add in the sugar and vanilla. Stir the melted ingredients into the egg mixture, mixing well. Stir in the dry sifted ingredients and mix well. Fold in the remaining ½ cup semisweet chocolate chips. Pour the batter into the prepared pan, and even with a spatula. Bake for 25 to 30 minutes, or until a cake tester inserted into the corner of the pan comes out with moist crumbs. Remove the brownies from the oven, and immediately sprinkle the marshmallows over them. Return the pan to the oven for 3 more minutes. While the brownies are baking, place the chocolate chips, peanut butter, and butter in a medium saucepan. Cook over low heat, stirring constantly until melted. Remove from heat, add the cereal,and mix well. Allow this to cool for 3 minutes or so. You don’t need to melt chocolate in a double boiler? i really want to make these, but i just want to clarify something before i make them. the butter says both 2/3 cup and 1 1/2 sticks…so is it 2/3 cup or 3/4 cup?? Kelsey I noticed that too, and ended up just using 1 1/2 sticks (which is NOT 2/3 cup). Does that sound to mean? NO??? Not mean enough?? I can do better. Ooh, these look delicious. I will put them in the “recipe to try when you have lots of time/patience” file. Everything on your blog looks so delicious and tempting! These brownies really caught my eye… I will definitely be trying these out! Thanks! I made these yesterday and they are pretty tasty. The brownies end up being a bit dense, but the topping is phenomenal! They also end up being really tall with the marshmallow topping; too tall to bite into. I cut small pieces and eat them side-ways. So, I’d suggest making a thinner brownie (make 1/2 the recipe instead) and keep the topping amount the same. Also – mix in regular chocolate chips into the batter, not the 1/2-c of semi-sweet ones; I found the recipe to be a little on the bitter side and I have a pretty big sweet tooth that was looking for something sweeter. An easier way to make this is to use box brownie mix (Ghiradelli Double Chocolate or Betty Crocker Fudge Brownie are my two favorites) instead of making the brownie layer from scratch; then follow the directions for the marshmallow and rice crispy layers. Yummy–almost too rich, but I probably feel that way b/c I was tasting along the way. I bet when I eat one tomorrow it’ll be perfect. hiya! is the brownie base very dense? i’m looking for something that is very sturdy and can even be sturdy enough to mail (i’d leave off the topping). @sweetie – The brownies are definitely dense! Let me know how the post office handles them!